February 24, 2018 – Vancouver: The winners of the 15th Annual Small Business BC Awards were announced last night at the awards’ glamourous gala celebration. Out of 50 small businesses that made it to the finals, 10 walked away with a coveted award. The celebrations included two cocktail networking receptions, a three-course gala dinner, and the awards ceremony, hosted by Erin Cebula and an esteemed panel of sponsors. Attendees included the Minister for Jobs, Trade and Technology, Bruce Ralston, Assistant Deputy Minister Gerry Salembier, MLA’s Rick Glumac, Joan Issacs and Jordan Sturdy, numerous Mayors and elected officials, and hundreds of small business owners and supporters. 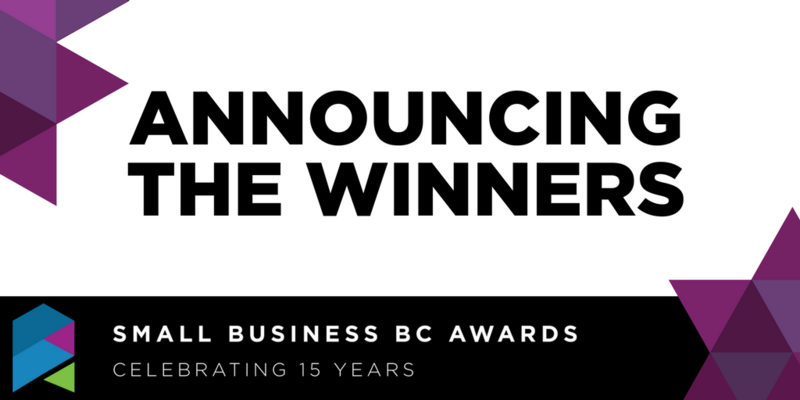 The category winners were awarded the Premier’s Prize in the amount of $1,500 cash, a one-year All-Access Pass to Small Business BC education and experts, and the honour of being named one of B.C.’s top businesses. “The Small Business BC Awards are a demonstration of the strength of B.C.’s small business sector,” said Minister of Jobs, Trade and Technology Bruce Ralston. “As this year’s contest shows, our province is privileged to have a diversity of innovative entrepreneurs working hard to create good jobs, build better communities, and grow a sustainable economy throughout our province.” Nominations for the 2019 Small Business Awards will open in October, 2018. Nominations are open to the public; more information can be found at sbbcawards.ca. This year’s Small Business BC Awards Gala was held in conjunction with the Open for Business Awards, which not only celebrate B.C.’s local small businesses, but also the communities that they reside in. “Apprenticeship is essential in trades training and it wouldn’t be possible without employer champions that are hiring and training the next generation of tradespeople in BC. In sponsoring SBBC’s Best Apprentice Training Award, we are celebrating the winner as well as all the nominees across the province, as they are all doing their part in ensuring that BC’s skilled trades continues to grow strong. Congratulations Northern Legendary Construction Ltd. on your well-deserved award. Keep up the great work!” – Gary Herman, CEO, Industry Training Authority. “Small businesses have the ideas, unique offerings and determination to grow beyond our borders. UPS Canada is proud to be a part of the 15th Annual Small Business BC Awards, and continue to support the international growth of Canadian small businesses. Congratulations to the winner in the Best International Trade category, Ironside Design Manufacturing.” – Paul Gaspar, Director of Small Business at UPS Canada.